SYRACUSE — Labor Day weekend got started off in a fun way for a lot of local kids. 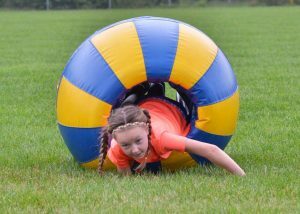 After being rained out the week before, the Syracuse Parks and Recreation Department returned to the Harold Schrock Athletic Complex Saturday morning to host the inaugural Kid Olympics. 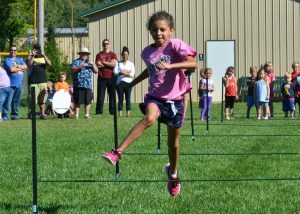 The event is exactly what it sounds like, an Olympic outing made just for kids. The creative event had everything from multiple events, to podiums and even medals for the top three competitors in each event. 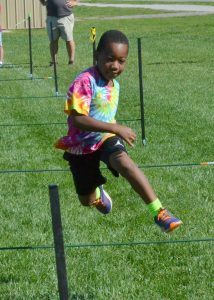 Competitors competed in a soccer challenge, obstacle course, baseball throw, hurdles, broad jump, 40-yard dash and distance run. There were three age groups, leaving plenty of opportunity for everyone to have a chance at winning. The most diverse group of winners was in the kindergarten through first grade division. That age group produced eight different winners in the events between the boys and girls. 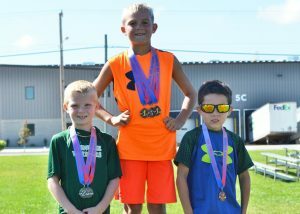 Harry Brunner took home gold in the obstacle course, baseball throw and broad jump. 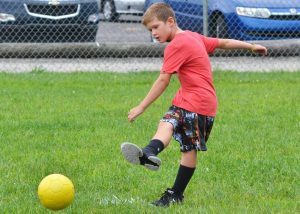 Liam Hodgson was a two-time winner with a first place finish in the soccer challenge and in the distance run. Bryce Johnson won the hurdles event while Cash Walters won the 40-yard dash. For the girls in that age group it was Emily Ringler who found the top spot on the podium the most. 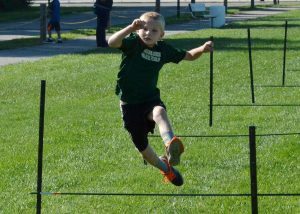 Ringler was first on the obstacle course, baseball throw, hurdles and 40-yard dash. 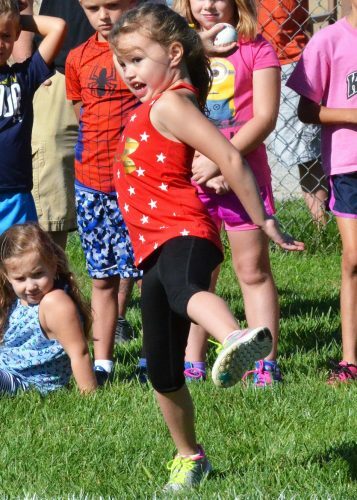 Scarlett Hardy earned gold in the broad jump. 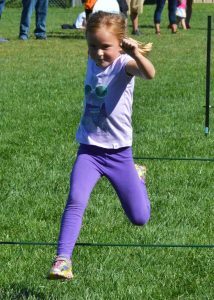 Addison Barger reigned supreme in the soccer challenge and Zaiyla Shortill capped her day with a win in the distance run. In the second through third grade group it was the Bo Brunner show on the boys side. 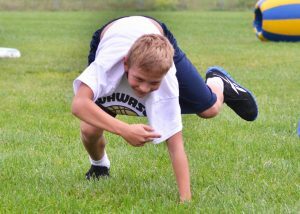 Brunner took first in the 40-yard dash, broad jump, baseball throw, soccer challenge, obstacle course and distance run. Alexander Tilton-Head was able to take first in the hurdles for the boys. 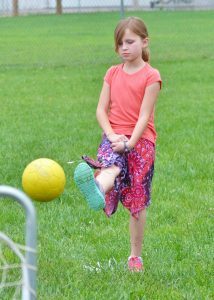 On the girls side it was a big day for Mia Hodgson. Hodgson took first in the 40-yard dash, hurdles, baseball toss, distance run and soccer challenge. 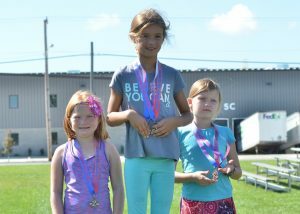 Charlotte Kampagne won the broad jump while Joscelyn Gibbs was first on the obstacle course. For the fourth through fifth grade boys division, well, it was all about Ty Brooks. The kid gave his best Michael Phelps impression by sweeping the events, earning gold in all seven. 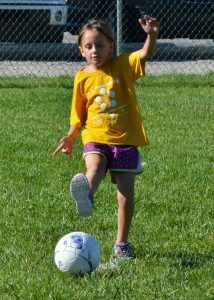 Molly Beer was not far behind on the girls side. Beer was first in the soccer challenge, obstacle course, distance run, hurdles, broad jump and baseball toss. Mia Truex took first in the 40-yard dash to break Beer’s streak. The turnout was impressive, given the reschedule and the fact that it was the first time for the unique event, and event that was first thought of four years ago. McLead stressed making the event as simple as possible. The main objective was for all involved, volunteers and athletes, to have as much fun as possible. “We wanted to keep it fun,” McLead continued. “We wanted a diverse group of events, I think we accomplished that. I think everyone had a good time. Partnering in helping with the event were the Lakeland Youth Center and Wawasee girls volleyball team.